Holly, MI – At 806 N Saginaw Street in Holly is a place called Northern Oak Brewery. I don’t drink beer, so sadly I cannot speak to their main product. However, I do like food. And this place has some really good sandwiches as well as another specialty – kettle chips. I’ve written about the kettle chips before. They are Michigan made kettle chips smothered with Gorgonzola dressing, diced tomatoes, red onions, bacon and scallions and topped with cheddar and Gorgonzola crumbles. For my most recent visit I also had what I am pretty sure is the best Corned Beef Reuben I’ve ever had in my life. 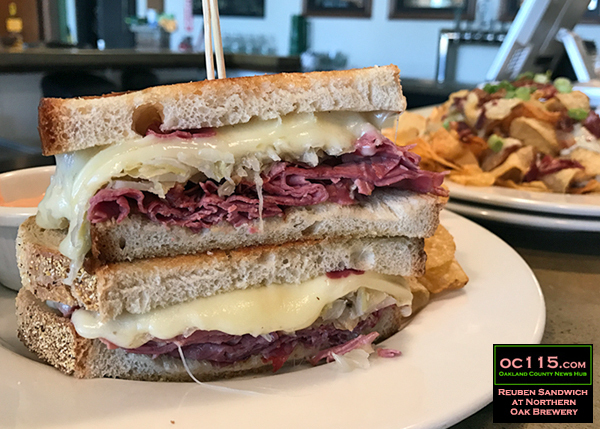 This large and delicious sandwich features melt-in-your-mouth sliced corned beef, quality sauerkraut, Swiss cheese and 1000 Island dressing served on toasted rye. I like this spot also because they have large windows that face towards a lake, and a simple, clean atmosphere. There are several great dining options in Holly that are not cookie-cutter chain restaurants, and I recommend that if you make a day of exploring this great “up north” village, you let your taste buds do some exploring too. Check out the Northern Oak Brewery website at http://www.northernoakbrewery.com/.